TWSF has eaten a lot of lobster rolls lately, 3 rolls in the last 4 days to be exact. This is pretty amusing considering neither of us remember ever having tried one of these luxury sandwiches before. Our lobster roll review compares different style rolls, from different locations along the East coast. All were edible, but some really paled in comparison to others. We present these rolls in order of when they were eaten. TWSF journeyed up to New England for Labor Day weekend. We spent most of our time at Hampton Beach, NH with my family, relaxing, eating, and playing cards. At the beach on Saturday, we started talking about lobster rolls, and my cousin informed me that one of the pubs on the boardwalk, McGuirk's, claimed they had the "best lobster roll on the beach." I thought it was a pretty bold claim, but one of her trustworthy sources told her that it was in fact, true. With all the hype of the Red Hook Lobster Truck in D.C., TWSF deemed it necessary to try "the best lobster roll" at Hampton Beach. The lobster roll was listed at market price, and upon hearing $17.99 for one roll, TWSF decided to split it and pair it with some clam strips. We couldn't believe our eyes when the waitress served us the roll, it was HUGE! It's really unfortunate we don't have a picture because it is probably the largest lobster roll either of us will ever eat. It had huge chunks of lobster, probably two lobsters worth of meat including intact claws. The meat was lightly coated in mayo (TWSF doesn't like mayo, but there was hardly any on it) and chopped celery, served on a loaf of French bread. Even with splitting the roll, we were completely full by the end of the meal. We decided to walk from the downtown area along the Marginal Way to Perkins Cove (note to girls: there was a beautiful wedding along the way, white tent on a huge green lawn in front of a gorgeous beach house on the cliff, overlooking the water and beach below, sigh…). I know I should have consulted my friends, who are very knowledgeable about the local eats prior to lunch, but I figured we'd go to Barnacle Billy's, and establishment known for their lobster (they later scolded us for not discussing lunch options with them first). Well Barnacle Billy's, you are now in our book as a "tourist trap." I have eaten their before and always enjoyed my meal, but in retrospect, I wasn't paying for it myself so wasn't analyzing my food as much. We went to the take-out side of the restaurant, and ordered the following to split: 1 lobster roll ($17.95), cup of lobster stew ($10.95), cup of clam chowder ($5.25), and rolls with butter ($1.50). Once you order at the counter, you find a seat outside or inside (I recommend the outside, there is a great deck overlooking the water and boats) and numbers are announced over a loud speaker. We didn't wait very long for our food, so that was a plus. As for the food, the lobster roll was tiny. I know it was likely the size of a normal roll (think, hot dog bun), but compared to the lobster roll we had at McGuirk's, this was just disappointing. Not only was it small, but it had hardly any big chunks of lobster in it, and was covered in a lot of mayo. The clam chowder was okay, but a little thin for our taste. As for the lobster stew, I will never order that again. It had the chunks of lobster I was looking for, but that was pretty much the only thing in the cup. It almost tasted like they drained the water from the lobster pot into a cup, threw a couple chunks of meat in, and called it a day. The rolls were ordinary, and didn't scream "homemade" like I was hoping. Since we are comparing lobster rolls here, TWSF ranks Barnacle Billy's lobster roll lowest on the totem pole. If you do venture to Barnacle Billy's for the view, I'd recommend getting the Rum Punch and steamers, they are actually really good there! Food trucks are becoming quite a popular thing. Food Network and the Cooking Channel have both run episodes about the revolution, as food trucks are popping up in every city across the U.S. One of the newbies of the D.C. food truck crowd is the Red Hook Lobster Truck. Being from Massachusetts and a lover of lobster, I was psyched when rumors started flying about the truck. 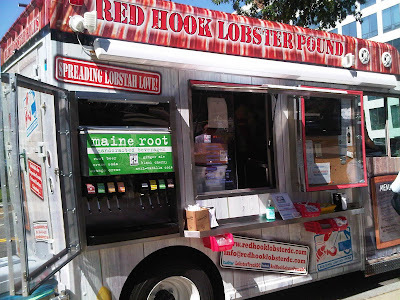 Just to give you a little background, this truck is an offspring of the Red Hook Lobster Pound located in Brooklyn, NY. The owners, Ralph and Susan Povich opened the joint in hopes to bring the freshest lobster to NYC. Ralph drives up to Maine weekly and brings back the best lobster he can get his hands on. That's dedication (and the sign of someone who knows their lobster!). The lobster truck sent to D.C. for the summer is their newest addition to the Red Hook Lobster Pound business. Yesterday morning before work, I randomly checked online to see where the Red Hook Lobster Truck was going to park for lunch. I was elated to find that they would be only 2 blocks away from work, solidifying my lunch choice for the day. The truck typically announces it's exact location around 11:00 am and gets to the location by 11:30 am, so I kept my eye on the clock. As expected, their exact location was posted, so I grabbed my purse and started walking, quickly. You should have seen me; I was doing that "mom speed walking" thing. I was so excited and a little anxious all at the same time, my heart was pounding from a fear of a long line and more likely from walking too quickly. At first, I actually walked by the location because I didn't see the truck anywhere. After turning around and heading back to the posted location, I found a line on the sidewalk, still with no truck in sight. At first glance it looked like a bus line, but when I considered the fact that it wasn't normal commuting time, I decided to approach some of the people in line and asked what they were waiting for. They gave me the answer I was hoping for: "lobster truck." I hopped into line (lucky #7) and waited for the arrival of my much anticipated lunch. When the lobster truck arrived, I felt like I should have started clapping. I haven't felt this level of anticipation since my first N*Sync concert.You could tell everyone was jumping out of their shoes as if Jonathan Taylor Thomas and Devon Sawa were scheduled make a guest appearance for a Tiger Beat signing and eat lobster rolls with all their fans. The truck took a few minutes to set up, but quickly started taking orders. If I count the time I waited from the start of ordering, I only waited about 5 minutes, not bad considering some people have waited over an hour in that line. When it was my turn, I knew exactly what I was going to order, I mean I had been thinking about this since I found the first review of the truck online. 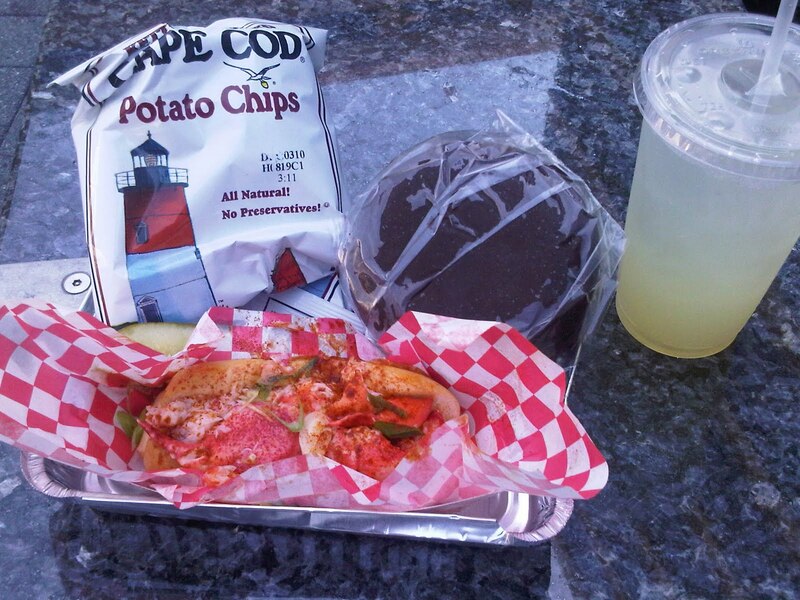 I ordered the "Lobster Roll Meal" for $18, which included your choice of roll (I chose the Connecticut-style), drink (can't say no to some fresh homemade lemonade), and Cape Cod chips. Sounds like a lot, but I wasn't done yet. On top of all that, I ordered a huge whoopie pie for $3.50, one of the best treats to come out of New England (I know it has Amish origins, but the creation of marshmallow fluff out of Massachusetts brought the cake up North). For those of you who just want a lobster roll, it's $15. The truck also offers a less pricey shrimp roll (I think it was $8? Don't quote me on that, I wasn't paying much attention to shrimp yesterday). For those of you that don't have cash, don't fret, they have a credit card machine attached to an iPad (how cool is that?). The lobster roll was amazing. Since I'm not a huge mayo fan (read: I hate mayo), I was happy to have the option of a lobster roll drenched in melted butter and sprinkled with paprika. It was served on a normal hot dog bun, same size as Barnacle Billy's roll. However, it was FILLED with huge chunks of lobster meat. In fact, there was no extra filler at all and the butter melted into the bun, making it incredibly tasty as well. I had meant to slowly enjoy the roll with my chips and lemonade, but it was gone before I could even pop open the chips bag. Just writing about it makes me want to get another one. If lobster wasn't so dang expensive in D.C., I'd try making this at home. The homemade lemonade made the sunny day even sunnier. Paired with those salty Cape Cod chips…ugh I just wanted to be back in New England, preferably on a beach. I saved the whoopie pie for a mid-day snack at the office. The whoopie pie was well worth the $3.50, I had some and shared with my office mates, and was still able to bring the rest home for Chuck to try (he insists mine are better, check out the recipe here). Red Hook Lobster Truck, you nailed it. I will be following you. I hate to turn my back on my roots, but the Connecticut-style lobster roll from the lobster truck was hands-down my favorite. The butter was just awesome, and to be honest, a more logical sauce for a lobster roll. The quality and size of the lobster roll from McGuirk's definitely puts it on the top tier, but I just don't see the reasoning behind coating a beautiful lobster with disgusting mayo. Compared to the others Barnacle Bill's lobster roll ranks too low, just don't get it.